Skinned out chicken is a good source of high biological value protein. Fried Chicken is not a healthy option for a person planning to lose weight. 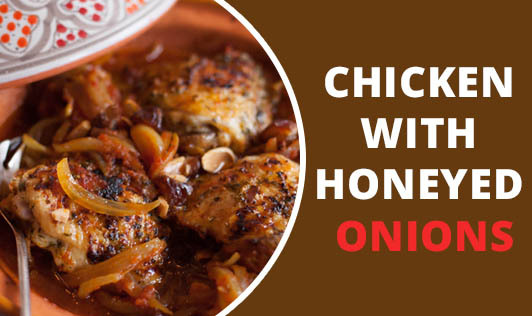 Here we bring you the recipe of ‘chicken with honey and onions'. This recipe is rich in protein and good carbohydrates. 1. To make marinade: place mint, garlic, yoghurt, mustard and mint sauce in a large glass bowl and mix. 2. Add chicken pieces, turn to coat, cover and refrigerate for 3 hours. 3. Preheat Barbeque plate to medium heat. 4. Honeyed onions: heat oil on barbeque plate, add onions and cook, stirring constantly, for 10 minutes. Add honey and vinegar and cook, stirring, for 5 more minutes. 5. Drain chicken, place on lightly oiled Barbeque and cook each side for 2-3 minutes. 6. Serve topped with onions. Share your favorite chicken or barbeque recipe with us and we will give it a makeover! Go to "tools --> recipe makeover".